With just 15 days left until Rogue One: A Star Wars Story hits theaters, star Felicity Jones stopped by The Tonight Show Starring Jimmy Fallon last night, to debut the first clip. The actress also showcased some of the impressive fighting skills revealed in the clip, with a reluctant Jimmy Fallon standing in as a "Stormtrooper." While the late-night talk show host escaped from the demonstration unscathed, the Stormtroopers in this new clip did not. In addition, we also have new posters from Rogue One, one of which features the main heroes standing in the shadow of the Death Star, which will be given exclusively to fans who attend Rogue One at Cinemark theaters. The scene that debuted on The Tonight Show features Felicity Jones' Jyn Erso and Diego Luna's Captain Cassian Andor, who are both trying to escape from a battalion of Stormtroopers. 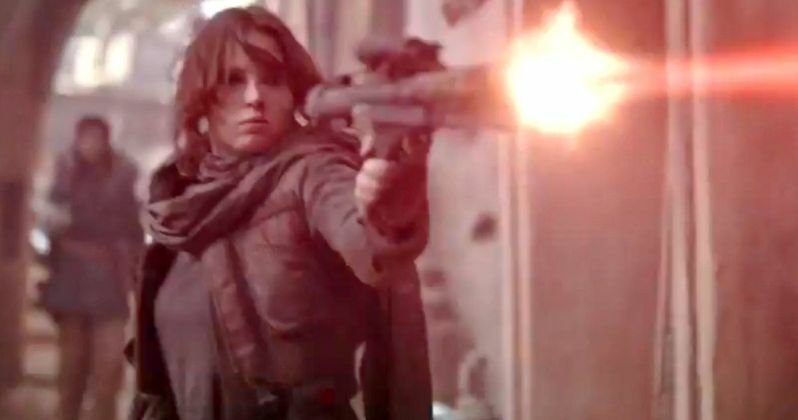 While Andor tries to lead Jyn Erso away from these troopers, he soon learns that she can take care of herself, as she takes out a number of Stormtroopers with her baton, using the same moves she showed Jimmy Fallon. The end of the clip features a bit of comic relief as well, featuring the new droid K-2S0 (Alan Tudyk). This clip comes just one day after we learned that post-production wrapped on this first Star Wars spin-off, and after we learned that the reshoots resulted in a different ending. It remains to be seen how the ending was changed, and we may not know until long after Rogue One hits theaters, but one of the key new additions to the crew for these reshoots was writer Tony Gilroy, whose work resulted in a shared screenplay credit with Chris Weitz, with Gary Whitta and John Knoll receiving story credit. Best known for writing the first Bourne trilogy, Tony Gilroy was originally brought on to write new scenes for the reshoot and direct the second unit, but he also ended up supervising the edit during post-production, which resulted in a $5 million payday for the filmmaker. Box office analysts are predicting a $130 million opening weekend for Rogue One: A Star Wars Story, which is far below the $247.9 million record-breaking debut of Star Wars: The Force Awakens. This spin-off represents a brand new era of stories for LucasFilm, with the movie believed to not even include an opening crawl, so it's understandable that it won't bring in the same record numbers as Star Wars: The Force Awakens, which continued the Luke Skywalker saga that ended with Return of the Jedi, back in 1983. Still, if it matches or exceeds that initial prediction, it will still be a huge victory for the LucasFilm team. For those who want even more new footage, LucasFilm is teaming up with People Magazine for a special live-streaming event tomorrow, Friday, December 2 at 10 AM PT. Fans will be treated to never-before-seen footage and a Q&A with Director Gareth Edwards, Lucasfilm President and Producer Kathleen Kennedy, and cast members including Felicity Jones, Diego Luna, Ben Mendelsohn, Donnie Yen, Mads Mikkelsen, Alan Tudyk and Riz Ahmed. Take a look at the first clip from Rogue One: A Star Wars Story, as we continue the countdown towards the December 16 release date.